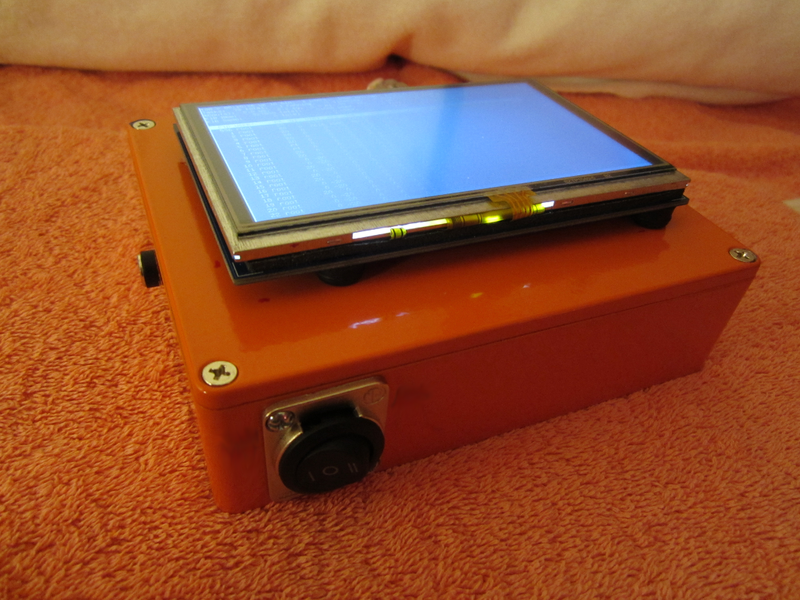 Figure 1: The Orange Box server with its new Pi Face (click to enlarge). So, the orange box server has gotten a nice facial. No longer a plain little orange server box, it’s less plain and sports an 800×480 “monitor” screen to keep tabs on what it’s doing. Currently it’s usb powered, but when I can figure out which header connectors on the back of the new face are safe to use for power, I’ll remove the ugly USB cable looped around on its top. I have a “cover” on order, and that should hide the edges of the screen and prevent most abuse to the fragile parts. Figure 2: The mounting standoffs were convenient, but mean the top will need a cover (click to enlarge). In figure two, the stand-off lugs can be seen (they are really faucet washers (from a home improvement plumbing department). The cover I have on order is a material repurposing aquisition. It’s an electrical junction box lid in a nice bright white color. Its dimensions are exactly correct so as to line up with all four edges of the orange enclosure. I will post photos after it arrives and I install it! I didn’t put the screen inside the box, because there’s already too much in there, and more coming! I should have an internal SATA by the time I’m finished. The nice thing about the five inch LCD is the very low power consumption. The little display takes only about 150 mA of current at 5VDC, which when added to the consumption of the board, still leaves me with less than 500 mA of total power consumption. I am really comfortable with 350 – 400 mA of current in “AA” NiMH Imedions, since that is “flashlight level” current, but it remains to be seen if I can pare the DC current down to that level. I have found that ten cheap NiMH “AA” cells are good for between four and five hours of operation. Really good NiMH bats should power the device for between seven and eight hours, but I haven’t yet ordered the Imedion NiMH “AA” size batteries for this particular project. I always have a big supply of the cheapies laying around, so was able to test the unit using them. 🙂 You never get the full mAH capacity from batteries in these kinds of projects. It’s because the batteries are unable to supply the full current when they are on the low end of the discharge cycle. The bottom twenty percent of the battery capacity is never drawn, because the DC-DC converter will shut down when it cannot pull enough current (if it’s a good one). If it’s a bad one, it’ll simply go out of regulation. If it’s a better bad one, it’ll always go out of regulation outputting a lower voltage than the target voltage (rather than a higher voltage). A flashlight, on the other hand, can discharge the batteries all the way down to zero (which is not a good idea with NiMH – it shortens the battery lifetime). So, a DC-DC converter that auto-shuts at 20 percent or so is actually a nice battery over-discharge protection. Adding a WiFi USB adapter would boost the DC current consumption by 80 mA or so. That would be another twenty percent down the drain (operating time). I’m likely to use one of the nRF24 devices (11 mA in TX, less in RX) in place of the WiFi. Note that most WiFi boards never go into RX only mode (what a waste). Now that I have the libraries lined up for the task, it should be pretty easy to duplicate in the orange box. 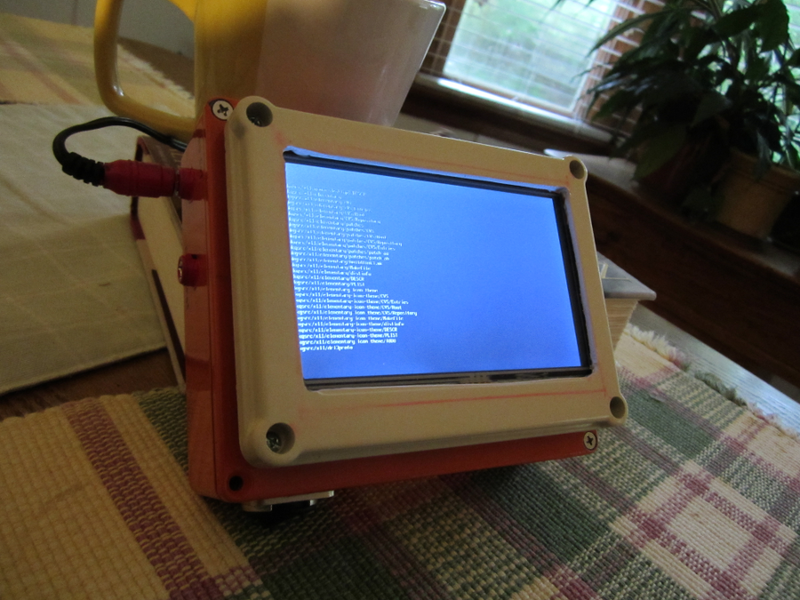 Figure 3: The electrical junction box cover used as a front piece to protect the display on the Orange Box Pi2 powered Server. The junction box arrived in the mail yesterday, and I took a couple hours to fit it to the Orange Box. A jigsaw made the panel cut for the screen, It’s a little rough on the edges, like the other tablets I’ve built, but it’s definitely one of a kind! Note the fingernail polish applied to the external power supply jack and plug. That keeps the wrong adapter from going where it shouldn’t! One last touch will be to bring the audio output jack out to the front panel (the junction box cover) – probably on the bottom of it where there is more room. The coffee cup was put into the picture for a size reference. The Orange Box Server is only six inches wide! There is a little space between the aluminum surface of the orange box, and the cover, where the gap is protected by a strip of non-conductive mesh, and it lets some ventilation thru and into the backside of the display area. The maximum temperature of an LCD while it’s operating shouldn’t be much over 95 or a hundred degrees. The inside of an unventilated enclosure that contains a processor of some kind can easily reach 95 degrees. Without a fan, the temperature inside the enclosure of the original homemade tablet reaches 95 degrees in thirty minutes!